AverLogic Technologies, has released reference designs for Home Audio/Video (A/V) Networking, Home A/V Network plus Ethernet Extension, and Audio Sender. These reference designs available from Glyn High-Tech Distribution are innovative digital home audio/video streaming solutions using existing power line infrastructure. With AverLogic audio/video streaming solutions through a home network using existing power wiring infrastructure, video can be viewed from different locations in the house. AverLogic’s Home A/V Networking reference designs, utilising Power Line Communications (PLC) technology, can distribute the A/V contents of DVD/VCD/VCR players and Digital set-top-boxes (STB), to LCD/ PDP TVs from one room to the other rooms. Each reference design includes a transmitter module (TX module) and a receiver module (RX module). Both modules have Ethernet interface which can be connected to Ethernet to PLC bridges to demonstrate the home-networking via PLC. The second reference design comes with embedded PLC adapters in the TX and RX modules. Both these solutions are enabled by AverLogic’s chipset consisting of AV network controllers, AL9M802, an MPEG-4/2 Encoder, AL9V576, and a video decoder, AL242. 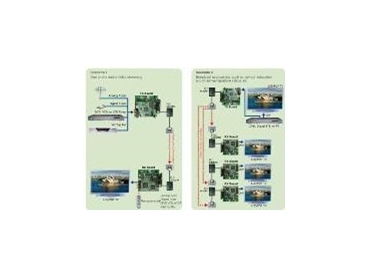 The Home A/V Networking reference design can distribute the A/V signals plus Ethernet data networking via PLC. IR blaster function enables users to control the video source devices connected to TX unit. It co-works well with PLC controllers, and has four reference designs of PLC sub-modules, each for a different PLC standard. It also illustrates co-existence of data and AV streams in the same power line environment. AverLogic’s Dynamic Bandwidth Management (DBM) technology ensures smooth video streaming quality, even under noisy power line environment. Other than the PLC A/V streaming solution, AverLogic has also recently unveiled its reference design of Audio Sender solution. The reference design allows sending data from DVD/ CD player, MP3, Audio Sender, i-Pod, and Digital Audio Broadcast (DAB) sources to speakers, and streams uncompressed audio files, whereas the audio resolution can be up to 24 bits, and sampling rate up to 192KHz. AverLogic’s new reference design for Audio Sender provides stable audio streaming by using dynamic bandwidth management.